How wartime planning brought fascism to America. John T. Flynn's classic work from 1944 on how wartime planning brought fascism to America. In some ways, this is the finest and most mature of all his works. It was written in wartime and his points were profoundly cutting. After all, the U.S. was supposedly fighting the total state abroad, but meanwhile at home was drafting people, controlling all prices and wages, rationing all goods, and enforcing a wicked central plan through massive government coercion. Were we becoming what we were supposedly fighting? Flynn said yes. The war on dictatorship abroad was bringing about dictatorship at home. Flynn was a prominent journalist and rare case of an American public intellectual who resisted the onslaught of both the warfare and welfare states during the period in which FDR ruled America. This study links the domestic policy of the New Deal with the drive for war and wartime central planning. He draws attention to the bitter irony that America was becoming precisely what we were fighting. His analysis of fascism is incisive and devastating. Though American conservatives (and liberals) have ignored this book and its lessons, it speaks of truths for the ages. His comparisons of the Hitler, Mussolini, and Stalin regimes with what was taking place in the United States are truly unforgettable. Flynn was not just a journalist but a real scholar and a moral critic of the police state. There is a reason why this great book is a classic of libertarian literature. 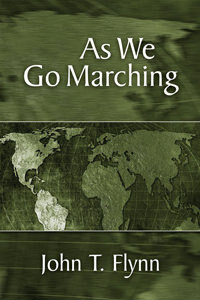 As We Go Marching from Mises Media on Vimeo.